These gourmet chocolates appeal to the most discerning of palates with their blend of high quality dark chocolate, chopped hazelnuts and the incomparable flavour of the highly-prized winter black truffle. 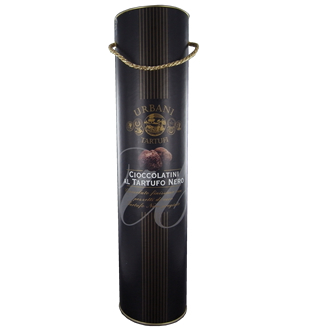 The small elegant tube adds a classy touch making these chocolates the perfect gift. Presented in the bigger tube the heady aroma of the black truffle is sure to make a lasting impression. Suggestion: the ideal accompaniment to a black coffee. To savour at any time of the day. Ingredients: cocoa powder and cocoa paste, grilled hazelnuts, sugar, powdered whole milk, cocoa butter, emulsifier: soy lecithin, black truffles 3%, truffle aromas, alcohol, infusions and natural aromas. Shelf life: 6 to 8 months.